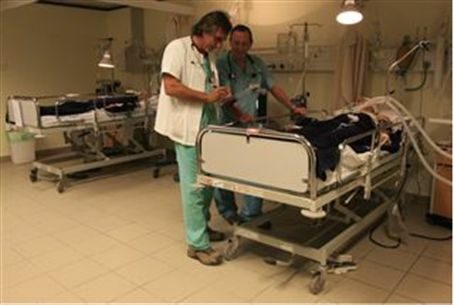 Seven Ukrainians scheduled to arrive at Kaplan Medical Center for treatment this week. Israel has begun providing Ukrainian citizens - victims of ongoing unrest and anti-Semitism - with much-needed medical treatment, Walla! reports Wednesday. Alexander, aged 20, landed at Ben-Gurion Wednesday morning, then rushed to Kaplan Medical Center in Rehovot for wrist surgery. Six others wounded in the Ukrainian unrest - which has seen violent protests, police brutality, and anti-Semitic violence - will be arriving in Israel Thursday to receive much-needed medical care. The initiative to provide humanitarian aid to the victims of Ukrainian violence has stemmed from Dr. Valeria Bivitzchik, a doctor at Kaplan who recently traveled to Kiev as a volunteer for the Red Crescent. There, Bivitzchik treated many injured from the violent clashes, and met Alexander, who suffered from severe shrapnel wounds to his hands and a crushed finger. Bivitzchik insisted that the young man be brought to Israel for better medical treatment. Israel has administered humanitarian aid to foreign citizens caught in war-torn countries before - most notably Syria. Israel has treated hundreds of Syrian refugees injured during the Civil War, which has killed over 130,000 since 2011.